Don’t waste a drop & ensure slaves swallow their perverted punishment! 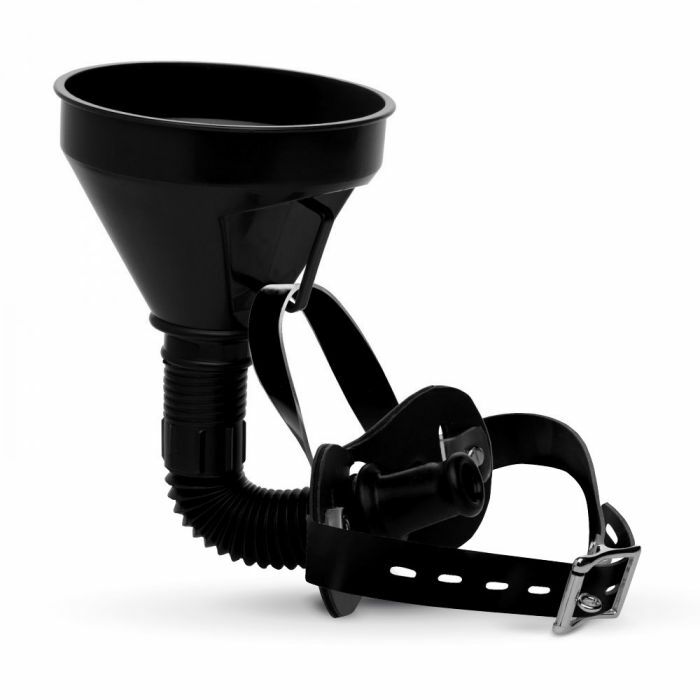 Tell your sub to pipe down, with the Master Series Latrine Extreme Funnel Gag! Innovative in design, this fiendish funnel gag features a strap to hold the funnel securely in place, which affixes using simple press stud fasteners. For greater versatility, the strap is completely removable allowing greater flexibility and more dominance/control in your humiliation play games. Fill the funnel with whatever takes your fancy and make sure your slave gets their fluids. Complete with a fully adjustable head strap, the Master Series Latrine Extreme Funnel Gag ensures the optimum fit, complete comfort and maximum gratification at all times. The buckle is even lockable for added security! Beautiful in black, this fantastic funnel gag is made from fine quality materials, including PVC and PU leather, and boasts heavy-duty metal hardware so that it really looks the part in any sadistic scene. Comfortable to wear for prolonged perverted play sessions, it is also incredibly durable. The gag insert is 1.85 inches long, which is the perfect length to keep the tongue pressed down and ensure all fluid is free-flowing. Indeed, superior satisfaction needn’t be down the drain, with the Master Series Latrine Extreme Funnel Gag!